I have been distracted today, both by a slightly crazy day at work and England defeating Ukraine 1-0 in the Euro 2012 'soccer' tournament. This victory (somewhat surprisingly) takes my home nation through to a quarter-final game against Italy on Sunday. 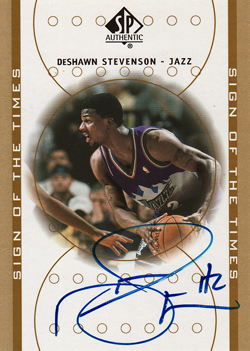 Consequently, this is going to be a quick and simple post to show off a couple of 2000-01 SP Authentic Sign of The Times autograph cards that arrived in the mail today. 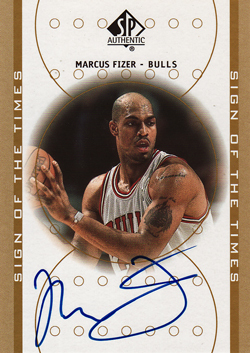 DeShawn Stevens (Jazz) and Marcus Fizer (Bulls) are 19th & 20th additions to my collection from this 48 card set and so take me past the halfway mark of this particular chase. I have to admit that this particular set building exercise falls under the "I've started so I will finish" category. There has been more than one occasion, when I have pulled the cards out of the cards and wondered why I am attempting to complete the set. The 2000-01 rookie class was pretty poor (with not a single player able to muster a scoring average above 20ppg), resulting in what can be best described as a pretty uninspiring checklist. The only stars to feature are Kobe Bryant, Kevin Garnett, Dirk Nowitzki and Reggie Miller; none of which I currently have in my possession. But, the autographs are all on-card and I do like the design. So having come this far, I have now hit the point of no return and will eventually close this chase out. The 20 cards that I do own, can be found on display here in my Photobucket. We have incredibly similar taste in cards. I started collecting 2000-01 SP Authentic cards when I bought a box back in 2000. I have a few autos from this set including Gary Payton, Tracy McGrady, Jermaine O'Neal, Jamal Crawford, etc. I agree that the checklist features a lot of weak rookies. I'd like to get the Nowitzki, Miller and a few others but doubt I'll chase the entire set. Will - glad to know that I am not the only one who thinks that completing this set is a worthwhile excercise!